Annual Congress of BLW Pastors and Partners Brings Thousands to Lagos, Nigeria. Thousands of delegates from around the world assemble for a week of impactful conferences. Thousands of delegates from around the world assemble for a week of impactful conferences. Beginning on Sunday, November 12th, thousands of ministers and BLW partners from every continent under Heaven began to arrive in Lagos, Nigeria, for a week of several conferences to equip them with new graces, gifts and visions. The International Pastors' and Partners' Conference is an annual congress of esteemed delegates who are at the front of the spiritual warfare for the souls of men. These men and women, teenagers included, have been inspired by the passions and convictions of the BLW President, Reverend (Dr.) Chris Oyakhilome, and now come to have fuel poured upon the embers in their hearts. Every IPPC is different, but this year's is particularly special, taking place in the 30th year since the BLW Nation was birthed by the Spirit of God. As the BLW CEO, Pastor Deola Philips, has emphasized, the number thirty is significant in scriptures and signals a new level of operation. The air is rife with festivity and pomp as each session has taken delegates down memory lane of the ministry's impact thus far. Intriguing music and arts ministrations flag off a special edition of the International Partners’ Conference. The 2017 edition of the International Partners' Conference kicked off a time of rejuvenation and renewal for thousands of delegates from across the ministry, who have congregated at the LoveWorld Convocation Arena in Lagos, Nigeria, to soak up an abundance of grace and receive divine enablement for greater triumphs. Sharing on 'the Kingdom-Conscious Partner', the highly esteemed BLW CEO, Pastor Deola Philips, prepared attendees for yet another timely and life-changing conference with the man of God, Reverend (Dr.) Chris Oyakhilome, celebrating significant attainments in 'the Year of Flourishing'. Stirring the celebratory atmosphere for 30 years of the Lord’s faithfulness, attendees were inspired to anticipate a greater move of the Holy Spirit in this watershed year, through exciting performances in music, dance and other arts by renowned LMAM groups and artistes. Delegates were inspired to continually increase their relevance in ministry as the Director of Programs, Pastor Lanre Alabi, rounded off the opening night. Pastor Chris shares principles for confronting troubling situations in this IPPC 2017 excerpt. During the first plenary session at the ongoing International Pastors' Conference, the BLW President, Reverend (Dr.) Chris Oyakhilome, began to extensively explore the subject of being filled with the Spirit, encouraging the global delegation to make this their daily experience. Pastor Chris communicates spiritual principles for winning everyday. In the featured video, Pastor Chris gives insight into what to do when you are disquieted in your spirit. Referencing Joel 2:28, Pastor Chris communicates the importance of stirring up the gift of God with the intention of receiving that specific prophetic Word required to transform your circumstances. "As I give out the prophetic Word, I know I’m a victor; I’ve won," he exclaimed! "With a life like that, how could you ever be defeated? In all these things, we are more than conquerors," the man of God triumphantly declares! BLW President explains why the Christian, filled with the Holy Spirit, need not “enter” the presence again. In his teaching on 'Being Filled with the Spirit' at the ongoing Pastors' Conference 2017, the man of God, Reverend (Dr.) Chris Oyakhilome, said to delegates: "the Holy Spirit brings you into the presence of God...you are now in the presence of God, and you are the presence of God!" This revelation, describing our inseparable oneness with the Lord enlightened delegates with scriptural truths on the divine presence of God. Pastor Chris went further to unveil the role of the human spirit as the ark of God today, where the presence of God dwells, because His commandments are contained in it. You are now the living ark of testimony; you are now the tabernacle of His presence," the President said, taking off the limits in the hearts of everyone present through the revelations of the Word. What made these truths so transformative for everyone that listened was the fact that they were not communicated to delegates as ministers of the Gospel but as Christians — those who have been recreated and filled with the Holy Spirit! 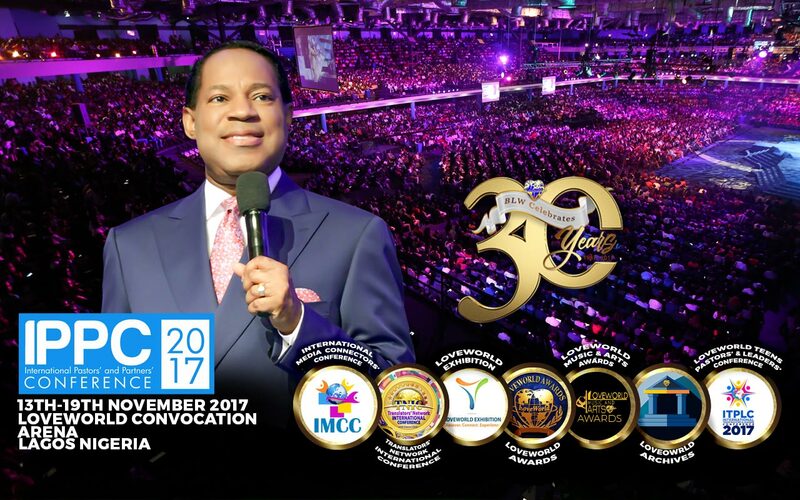 "I've been in ministry all these years, [and] I have never needed a breakthrough," Pastor Chris said to delegates in his first plenary session at the International Partners' Conference portion of the IPPC 2017. The man of God said this, emphasizing to delegates their privileged position in Christ that makes it such that all they require is to "come boldly to the throne of grace; obtain mercy and find grace to help in time of need," as the scriptures say. Building atop a series that began during the International Pastors' Conference, Pastor Chris helped the brethren realize that the solution to most of their challenges is to be filled with the Spirit. "The Lord moves when you move, because He lives in you," the BLW President said to the congregation of saints from around the world, letting them know there's no reason for the Christian that is filled with the Holy Ghost to ask (again) for a move of the Spirit like one that is disadvantaged.